For more than fifty years Skandia has been offering beautiful, innovative, high quality window treatments. And while their company name made sound exotic – Skandia is proud to be an All American company. All of their window shades, blind and shutters are made in the USA. In fact, Skandia operates a manufacturing facility right here in Southern California – as well as plants located in Florida and Georgia. Skandia’s window blind collections come in a wide array of fabrics, colors, patterns, styles, and light filtering opacities. And their variety of state-of-the-art, patented operating systems – including motorization – suit every lifestyle. Optional cord-free operation offers the utmost in safety for households with small children or active pets. And Skandia vertical blinds – and panel track shades – make the perfect window covering for large expanses such as wide windows and door-walls. Take a moment to peruse some of Skandia’s window blind offerings, below. Then schedule a free in-home window treatment consultation with our skilled window blind interior designers. Let us bring samples of window blind and shade styles, colors and fabrics to your home – and help you choose the window fashions that fit your style and your budget! The new and innovative Skandia “Window Shadings” collection offers the functionality of a horizontal blind with the soft and sheer appearance of a fabric window shade. This unique and on-trend window treatment combines the best of both worlds – allowing you to close the fabric shade, while also offering the option of tilting the horizontal blind “vanes” (slats). When the vanes are open, filtered sunlight flows through the sheer fabric shade – while still offering privacy. When the vanes and the fabric shade are closed entirely, you achieve maximum light control and complete privacy. Light filtering sheer, light filtering linen and light dimming opacities are offered in 2 inch vane widths – and in light filtering sheer or light dimming opacity with 3 inch vanes. 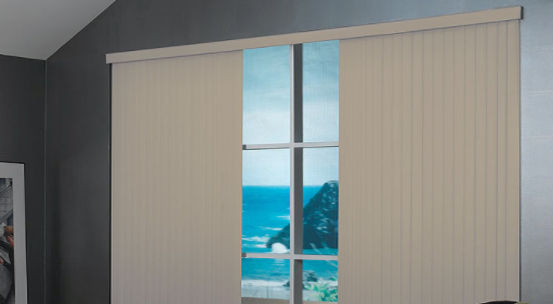 And – for the ultimate convenience – Window Shading Blinds are available with optional motorization. In fact, Skandia motorized Window Shading blinds has been awarded Best for Kids certification! Skandia vertical blinds are among the most popular window treatment for wide expanses – including patio doors, pool room doors and sliding glass doors. Skandia vertical blinds are perfectly adaptable to Southern California’s casual lifestyle because they are attractive – yet durable and practical – and exceedingly easy to maintain. And Skandia vertical blinds are offered in a wide variety of louvers – including PVC or fabric – in a wide selection of on-trend colors and stunning patterns. Versatile Skandia vertical blinds can also be stacked in any direction. They can be custom ordered to stack on the left side, the right side, or even in the the center of the door or window opening! You may also choose a one-way draw – in which the vertical blinds stack either on the right or left. Or you can select a split draw- where the vertical blind louvers will stack on both sides of the window – and can then be drawn closed from either side of the opening. Our talented designers will be happy to schedule an appointment in your home and show you a wide selection of window treatments – including Skandia blinds and shades – exclusively in the following areas: Agoura Hills, Bell Canyon, Calabasas, Westlake Village, Hidden Hills, Thousand Oaks, Camarillo, Malibu, Ventura, Topanga, Chatsworth, West Hills, Pacific Palisades, Oak Park, Somis, Montecito, Carpinteria, Santa Barbara, Newbury Park, Moorpark, Simi Valley, Northridge and Port Hueneme. Call: 818-597-0440.